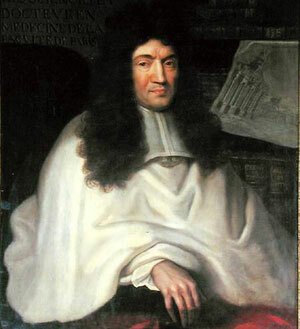 The Parisian doctor of medicine Claude Perrault (see biography of Claude Perrault) was a remarkable person—a typical encyclopaedic scientist from the end of European Renaissance. Graduating as a doctor of medicine, in his long life he was interested and achieved remarkable results in the fields of architecture, anatomy, physics, mechanics, zoology, physiology, etc. Eleven years after his death, in 1700, in Paris was published his small book—Recueil de plusieurs machines, de nouvelle invention... (Compendium of several newly invented machines...) (see the book digitized by Google). In its 22 pages of text and several pages of sketches are described nine inventions of Perrault. Between them are two machines for escalating and moving of burdens, a pendulum-controlled water clock, a pulley system to rotate the mirror of a reflecting telescope, and what is of a particular interest for us—a very interesting calculating device, called Abaque Rhabdologique. In the 1699's year issue of the french journal Le Journal des sçavans (printed in 1701) was also published a description of the Abaque Rhabdologique (pages 55-59). 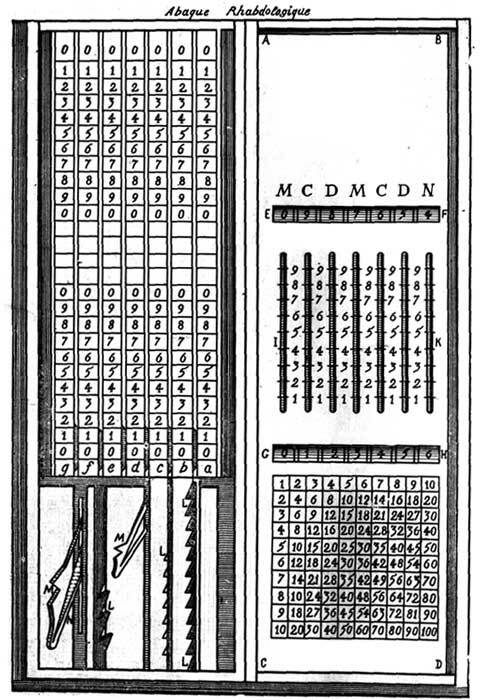 In the article in Le Journal des sçavans is explained that the name of the machine Perrault derived from the mathematical practice of the ancients, who had used tablets (abacuses) to write numbers, and who had the capacity to perform many arithmetic operations by employing small rods marked with digits (rhabdology). Abaque Rhabdologique was described in many other sources also, e.g. in the 18th century books of Jean Gaffin Gallon—Machines et inventions approuvées par l'Academie Royale des Sciences, depuis son établissment jusqu'a présent; avec leur description (see description of Abaque Rhabdologique from Gallon). The device was designed probably between 1666 and 1675 (at that time Perrault was engaged mainly in architectural projects, designing eastern facade of the Louvre, l’Observatoire de Paris, etc., so we can easily imagine that he needed some calculating tool), but it is unknown whether a working copy of the device has been made by Perrault. In present day exists only several replicas (see the photo bellow). The Abaque Rhabdologique is a small metal plate (30 cm x 12 cm x 0,7 cm) with thickness of a finger (see the sketch below) and weight 1.15 kg. Over the plate are mounted seven small rules (marked with letters a, b, c, d, e, f and g on the sketch), which can be moved upwards and downwards. The rules are graduated to 26 parts by deep cuts, and the edge of the pin, which actually moves the rules, can be push in these cuts. Between the cuts are drawn ascending and descending rows of digits, with four empty divisions between zeroes. The rule a represents the units column, the rule b—the decimal column, and so on to the rule g, which represents the millions. The rules are separated by thin plates, which have perforations in the bottom. Near the bottom of the each rule (with the exception of the rule for units), to the right side, there is a rule with 11 notches (marked with L), and distance between notches is equal to the distance between digits, marked on the rules. From the other side of the rule with notches by means of springs are attached the hooks M. Due to the separating thin plates, the hook will be hidden in the body of the rule till the moment, when the hook will become symmetrical toward the opening in the plate. In this moment, the spring will push out the hook, which will pass the opening and will clutch to the notch of the lower rule and will move it one division downwards, making a carry to the next column. On the front lid of the device ABCD are placed two long horizontal windows EF and GH. When the rulers are moving up or down, in these windows are seen the digits on the plates, and at every moment the sum of the digits of a particular ruler in upper and lower windows is always equal to 10. The window GH is used during adding operations, while the window EF is used during subtraction. Between the windows are made 7 narrow vertical channels I-K, which are divided to 10 and marked with digits. 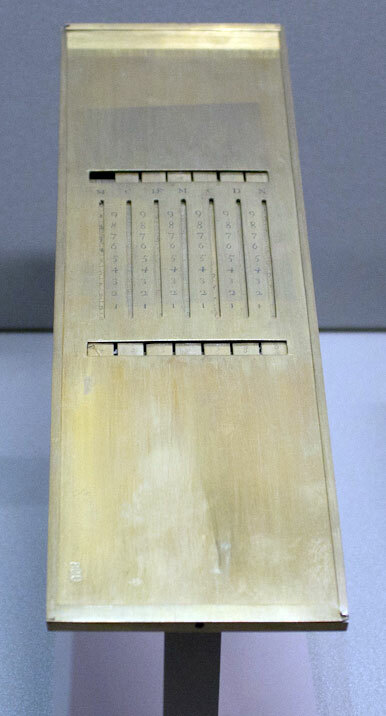 In the lower part of the lid is inscribed a multiplication table. For entering a digit, in the particular cut of a ruler, which can be seen in the vertical channel, must be put a stylus, and then the ruler must be moved, until the stylus touched to the bottom edge of the channel. After this action, the number, which has been entered, will be shown simultaneously in the both windows. If to an entered number, for example 7, must be add 6, we have to perform the same action. During the moving of the ruler a to the bottom of the device, the hook M will enter into cohesion with the cogs of the ruler b and will move it one division downwards. As a result of this in the decimal column will appear 1. In order to get the proper digit in the units column (which in this example must be 3), we have (without pulling the stylus out of the cut) to move the ruler upwards, until the stylus touched the bottom edge of the channel. During the performing of a subtraction, the actions of the operator are analogous, but the result must be read not in the lower, but in the upper window. If the minuend contains one or several zeroes, the result of the operation must be corrected. 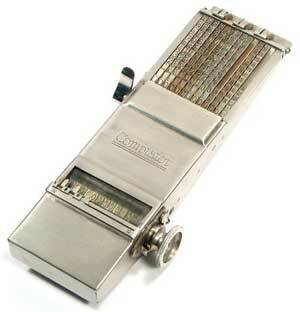 I call this machine Rhabdological Abacus because the Ancients called abacuses small tables or boards on which they wrote arithmetical numerals and because they called rhabdology the ability to perform various arithmetical operations by means of several small rods marked with digits. The machine that I propose does about the same thing. It is an abacus or small board about one finger thick, one foot long and half a foot wide. 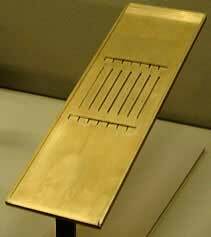 It is carved and made of thin ivory or copper plates, enclosing small rules marked with figures. In the cover plate, marked ABCD, two long and narrow windows in which the figures are displayed have been cut out, one EF at the top and one GH at the bottom. These windows are about three inches apart and the area between them has cut out grooves IK, ending at about fives lines of the windows and distant also about five lines from each other. Under the cover plate, several small rules a, b, c, d, e, f, g, lying side by side, can slide up and down: they are about 4 lines wide and seven and a half inches long: their length is divided into 26 equally spaced parts by engraved crossing lines. These lines are deep enough to hold in position the tip of a stylus used to move them. Twenty-two figures have been marked in the spaces between the engraved lines, eleven upwards and also eleven downwards: this is done in a way that four spacings are left empty between each series of figures. Thus we find, beginning from above, 0. 1. 2. 3. 4. 5. 6. 7. 8. 9. 0. and continuing downward, after having left four empty spacings, 0. 9. 8. 7. 6. 5. 4. 3. 2. 1. 0. Between the grooves, the cover plate is marked upwards with the nine digits 1. 2. 3. 4. 5. 6. 7. 8. 9. keeping the same spacing as on the rules. When the rules are lowered or lifted, the digits show one by one in the windows, but in a way that two digits of the same rule appearing in the two windows always sum up to 10. That's to say, if the figure 9 shows in the upper window, the figure 1 will show in the bottom window, and if there is 6 in one window there will be 4 in the other one. These rules, lying side by side, represent the decimal order; the first rule at the right, marked N above the upper window EF, being for the units; the second one, marked D, being for the tens; the third, marked C, for the hundreds, etc. They are separated by very thin blades, which are interrupted by the value of three spacings; the middle of this interruption being opposite the bottom window. Each rule has LL rack-type notches at one side of the bottom, each notch being opposite the eleven figures, and at the other side a pawl M, to pull downwards the adjoining left-hand rule. To ensure that the pawl does not lower the rule it has to pull, more than one spacing, as is necessary, it needs to enter into the rule and stay hidden there, without being able to get out, until it is opposite the bottom window. Furthermore it has to retract as soon as the rule it is pulling has moved a value of one spacing. This is done thanks to two features: the first one is that a spring N shoves the pawl outwards; the second one is that the interruption of the blades separating the rules, enables the pawl to get out and engage into the notches of the rack. This engagement is possible only opposite the interruption and when the rule slides up or down; at the places where the blades are not interrupted, the pawl stays enclosed and is not in a state to engage. To use the machine, one puts the tip of a stylus in one of the grooves, opposite one of the digits marked from top to bottom between the grooves. Pressing the stylus in the engraving between the digits, one slides it until it reaches the bottom of the groove: the same number chosen by the stylus will then appear in one of the windows, the bottom window being for addition and multiplication and the upper window for subtraction. For instance, if one wants to obtain the number 8, one lowers this number in the window as previously explained: but if one wants to add 7, instead of this number, a digit 1 would show in the window as being the number of tens and nothing would show at the units location. In this case, without removing the tip of the stylus from the engraving where it presses, one has to slide it upwards to the top of the groove, and the digit 5 will then appear in the window at the units position. Thus, each time that the rule has been lowered as much as possible, nothing or only a 0 would show in the window, the stylus would have to be slid upwards. For subtraction, one needs to set in the top window the number from which another one has to be subtracted. For instance to subtract 34 from 123, one needs to put the stylus on the 4 of the units location and pull it to the bottom and then pull in the same way the 3 of the tens location. The number 123, which showed in the window, will then be replaced by the number 89. It must be pointed out that when the number from which another one is subtracted contains one or several 0s, one unit needs to be subtracted from the remaining number, that is to say the one after the 0 toward the left. For instance, if one wants to subtract 92 from 150, the machine will give 68 instead of 58, but the latter will be obtained if we subtract one from the 6 appearing at the tens location, and after the 0 of 150 which is of the units order. The same applies when there are several 0s. For instance, if one wants to subtract 264 from 1500, the machine will give 1346 instead of 1236, but the latter will be obtained by subtracting one unit from 4, because of the first 0, and another unit from 3, because of the second 0. For multiplication, one needs to do the same as for addition. For instance, if one wants to multiply 15 by 15, one needs to mark five times 5 which is 25 in the lower window by setting a 5 in the units location and a two in the tens location; finally mark one time 5 in the tens location and one time 1 in the hundreds location: this will give the result 225. The simple and ingenious idea of the device of Claude Perrault was step aside from the common development of mechanical calculating devices, which are based on the gear-wheels. This idea will be applied after two centuries in the several cheap, simple and reliable calculating devices, such as the multi-column adding machine, designed in 1891 by Peter J. Landin of Minneapolis (US Patent 482312) (see the computer of Landin), which will be later produced in several countries in great quantities and many varieties, e. g. popular Comptator in Germany. Several simpler implementation of the Abaque Rhabdologique can be found in the later devices of Caze, Kummer, Troncet. etc.